Ian Emberson, poet, playwright and artist, portrays the county and its people in a series of gentle anecdotes such as: Life in a small village, Asian dancing in Huddersfield, walking the Pennine Way, the choral singing tradition, even gardening and studying local history: many diverse elements of life in Yorkshire today are explored in a book that explores the county’s cultural traditions. 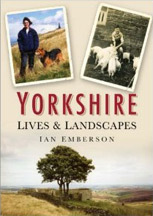 Ian Emberson has lived in Yorkshire for over 35 years. For many years he was a Music Librarian at Huddersfield, but has now retired in order to concentrate on writing and art. This is his eighth book.